Call Dominic Purnomo. One of the most knowledgeable and lovely wine guys around. He'd LOVE to do something like that I am sure of it!! I don't know of anyone who does that around here. But if you go to www.winefornormalpeople.com, you will see that the sommelier who runs the site has started doing live classes for small groups via skype. I believe she provides the attendees a list of wines to purchase before the class. She also has a podcast that you can download for free that covers lots of different wine related topics. Good luck. I'm tempted to throw my hat in the ring on this. I do love turning people on to wine. My schedule is crap for the next few weeks though. I've done things like this before, although not for strangers. 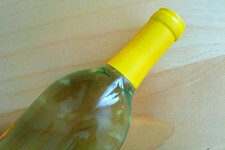 My contact info is on the blog (in addition to an archive of over 100 wine posts). Has anyone taken the wine class at From the Garden on Lark? I believe that Ric Orlando may be planning something at the New World tasting space on Delaware Avenue in the near future. I once went to a wine tasting at a friend's apartment that was hosting by a woman from the Traveling Vineyard company. It was fun and the wines were really good! Maybe they would be willing to do a multi-week thing for you. Hi all, this is Lauren. Thanks so much for the suggestions. My husband and I enjoy wine but don't know much about it, and would love to learn more. I thought maybe taking a few classes once a week would be a good way to start. Having little kids makes it difficult to make a commitment to being out of the house on a regular basis though; not so much for the expense of the babysitter as the challenge of actually making it out of the house. I thought maybe gathering some like-minded friends (could very well be more than 2-4) and having someone come to our place (kids go to bed early) would be a good alternative. Daniel, I follow your blog and will be in touch. There's no rush to schedule this, it was on my list of things to do in 2015. And I live right around the corner from the wonderful New World so that is a workable option as well. Thanks everyone - the All Over Albany community is great! @ Tam: I took a wine class at From the Garden. Although the people were lovely and it was a fun time overall, I do not feel that I learned any solid skills that I could take with me next time I was trying to pick out a bottle at the wine store or a glass at a restaurant. It was more about the "notes and flavors" we tasted and the colors of the wines, less about the names/regions/names of grapes, etc. Others may have had a different experience, of course. steadily for the School nearly 15 years. I also do in-home tastings when the request arises and would love to speak with you about that. Call 861-5627 or email.Dominick's great, too - check with him if you haven't yet. .